We have enjoyed the use of the Ariens Lawnmower. It starts easily and does a great job of cutting a 21 inch strip of the lawn. We bought it in 2004 and it has been a great machine to use over the last five years. We use the rear bag option during first couple of times of mowing the lawn each season, then switch over to the mulch mode. The change over is quick and easy to do. Just remove the bag put in the mulcher plug and it is ready to use as a mulcher. 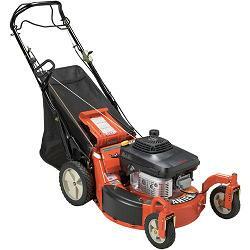 The Briggs & Stratton 4+ hp engine does a great job both mowing and driving the self propelling rear wheels. Removing the rear bag is quick and easy to do. There are no zippers or buttons required to empty the bag. Putting the bag on is very easy as well. Keeping the area where the bag attaches to the move clear of grass clippings is easy. I recommend keeping the area clean. Adjusting the height of the wheels for cutting the lawn is easy to do. There are seven setting for the height adjustment from a low of 1” to a maximum of 3-3/4”. We have used the mid-position 1-3/4” for our lawn. There is a lever for each wheel that controls the height. The height control locks in place and does not slip out of position. Safety controls for the Ariens consist of a blade/engine control that is located near the handle of the mower. It is easy on the hands to use and does not take much effort to keep it in the engaged position. When released it stops the blade/engine within several seconds. To start the mower the control must be held against the handle. Starting the Ariens is very easy. Just push the primer button a couple of times, hold in the safety control and pull the starter rope. The starter rope handle is conveniently located near the handle. Usually one or two pulls is all it takes to start the mower.